Live Nativity and Streets of Bethlehem! Vocalist Jenn Helle, Dyersville, Iowa. WHAT IS A LIVE NATIVITY? Experience the narrated Christmas Story, enacted by characters in period costumes. The story begins with the angel Gabriel's visit to the Virgin Mary, the Annunciation. The story is beautifully narrated, accompanied by a vocalist, bringing the historical account alive with song. The actors portray weary travelers approaching an Inn with no vacancy. Being given a place to stay in a stable, among the animals, the Christ child is born. The shepherds give homage to the little baby and the Magi present their valuable gifts to the precious King in the manger. The portrayal is simple yet profound. WHAT IS "STREETS OF BETHLEHEM?" The experience of what the streets of Bethlehem were like 2000 years ago. Guests will be counted for the census, meet the tough Roman Guards, see beggars in the street, encounter the Tax Collectors. As fellow travelers on the journey, guests will hear the sounds of the marketplace & take in the aroma of the rich incense. Merchant shops include carpentry, textiles, bread, clay vessels, incense, herbs and oils. The Streets of Bethlehem temporarily close during the Live Nativity in honor of the story of the birth of Christ. The Live Nativity is part of "The Bean Farm of Scotch Grove" and is a nonprofit: 501(c)3. Your contribution is tax deductible! Donations help us improve the production year after year and continue our work of spreading the good news. 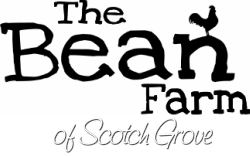 For more information, find us at: www.thebeanfarmofscotchgrove.org. There is a concession stand available where weary travelers can get something warm to drink and buttery popcorn. WILL THERE BE LIVE ANIMALS? Yes, there will be live animals. They will be spotted throughout the Live Nativity and weather permitting, roaming around the Streets of Bethlehem. Plus, the animals that didn't make the cut during the Nativity try-outs will be in the mini-barn for extra attention from guests. They'd really appreciate a visit. No, tickets aren't necessary. However, there could be some waiting in line so we humbly ask for your patience and understanding. Given that we live in Iowa, there's a pretty good chance it could be cold. A couple buildings will have some heat and there will be fires burning near the Streets of Bethlehem. Please dress warm. WHAT WILL YOU DO IN THE CASE OF SEVERE WEATHER? We are prayerful that mild weather will be provided for the weekend. In the case of a blizzard, we will list cancellations/postponements on local radio and TV stations. Most areas are not paved but navigation in a wheelchair is possible. There is a portable toilet that is wheelchair accessible. To view the Live Nativity, the ground somewhat uneven but a wheelchair can navigate. For those in need, there is a place for drop off/pick up to lessen the walking distance. Well, yes we do!!! So glad you asked! PLEASE VOLUNTEER! Send an email to: thebeanfarmiowa@gmail.com if you can volunteer in some way. We have needs for actors, greeters, donations of food/supplies etc. The work is hard yet extremely rewarding. Please join us! Seeing the story come alive will help to keep Jesus at the forefront of Christmas. No amount of beautifully wrapped gifts under our tree can fulfill us to the degree of the gift He gave us by coming to earth as an infant, more than 2000 years ago.